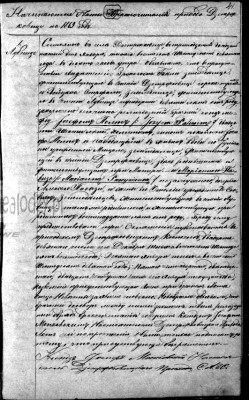 Could you please translate this marriage document #11 of my great great grandparents, Franciszeeka Konarzewski and Wiktoria Banaiak in Koscielna Wies. Wiktoria Banasiak, a miss, 21 years old, daughter of spouses: Wojciech Banasiak and Anna Banasiak nee Marciniak, born in Dębianki located in Włocławek county, living with her parents, laborers in Kościelna Wieś. 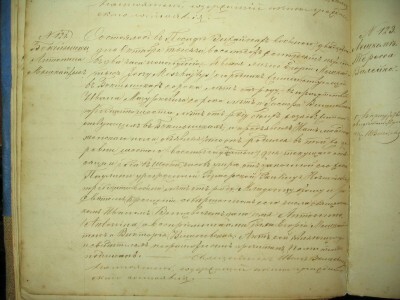 This marriage was preceded by 3 banns on: 20 September, 27 September and 4 October of the current year announced in Kościelna Wieś parish church. 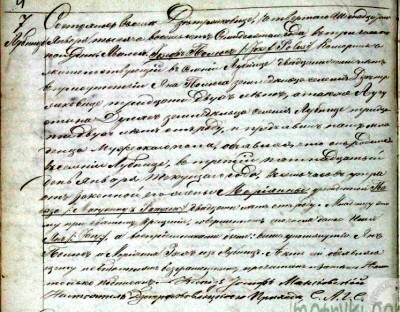 Bride's parents, present during writing this marriage act, gave oral permission for this marriage. Newlyweds informed that they didnt make any premarital agreement. Religious marriage ceremony celebrated by the priest Franciszek Michalski, Kościelna Wieś parish parson. This act was read aloud and signed only by Us because newlyweds and witnesses are illiterate. Jozef Kruk birth 1847 & Marjanna Sobotka 1857. Josef parents Jan Kruk and Wiktoria Skrzecz. Marjanna Sobotka parents Jan Sobotka & Franciszka ?Sobotka. Marcjanna Sobotka, a miss, born in Brzeźno, daughter of late Jan Sobotka and living widow Franciszka Sobotka nee Sobotka, legal spouses Sobotka, gardeners???. She lives in Brzeźno Kolonia with her mother, 18 years ago. this marriage was preceded by 3 banns announced in Wąsewo parish church on: 12/24 October, 19/31 October and 26 October/7 November of the current year. 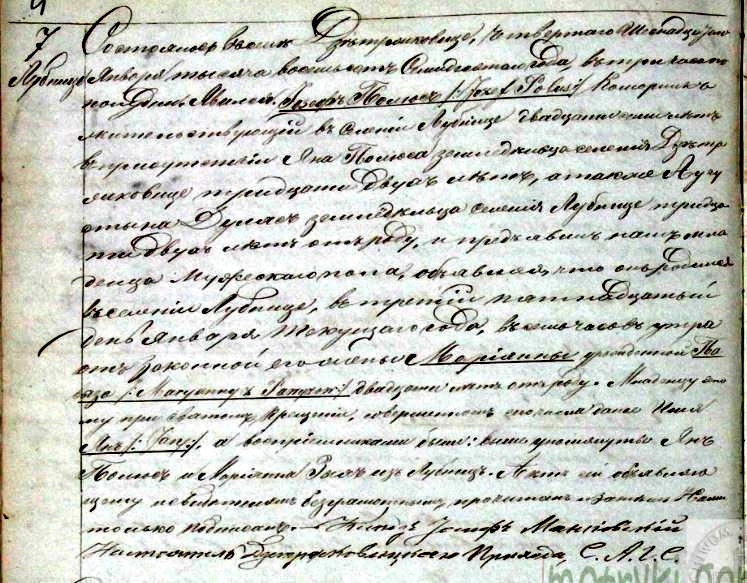 Bride's mother and groom's father present during writing this marriage act gave oral permission for this marriage. Religious marriage ceremony celebrated by the priest Wincenty Tabęcki, Wąsewo parish administrator. 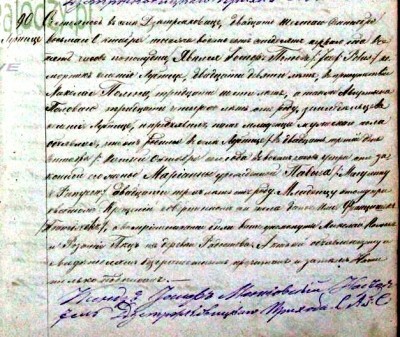 priest W. Tabęcki signature, serving as civil registrar. I am having an issue with the birth date of this Ferdinand Eiswald. I have relatives in Michigan saying his birth date was July 11, 1868 but I had someone trying to translate saying it was June, 1868. I understand that translating June and July can be confusing. Please confirm which month Ferdinand was born. His parents were Krystyan Eiswald and Karolina Wiese. Was he born in Gniejno? It happened in Ossówka on the 12th day of June 1868 at 5 p.m. Appeared Krystian Eiswald, farmer from Gnojno, 46 years old in the presence of Michał Rec, 36 years old and Michał Wiese, 28 years old, farmers from Gnojno and presented Us a male child and informed that the child was born yesterday (11th June) in the village Gnojno at 7 a.m. with his legal wife Karolina nee Wiese, 33 years old. At the Holy Baptism held today the child was given the name Ferdynand and the godparents were: mentioned above Rec and Wilhelmina Wiese. This act was read aloud to to the illiterate declarant and witnesss. Information: Rec could be written Retz. Record translation. I have two records from the Church in Wizajny Poland. I believe this record is for my Great Grandmother Antonina Miszakejce? 1876 to 1956 birth. She married Leonas Murawska 1869- 1952. She was from Bokszyszki. I believe her husband was from Mazutkine. The quality of the record is not great. 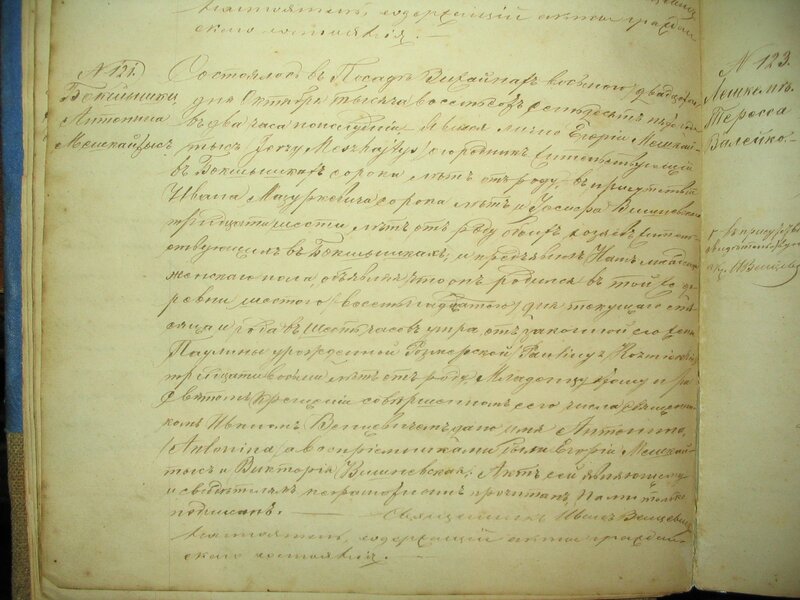 I added the additional information because maybe it is here marriage record. I am not sure. Thank you for your expertise in translation of these records. 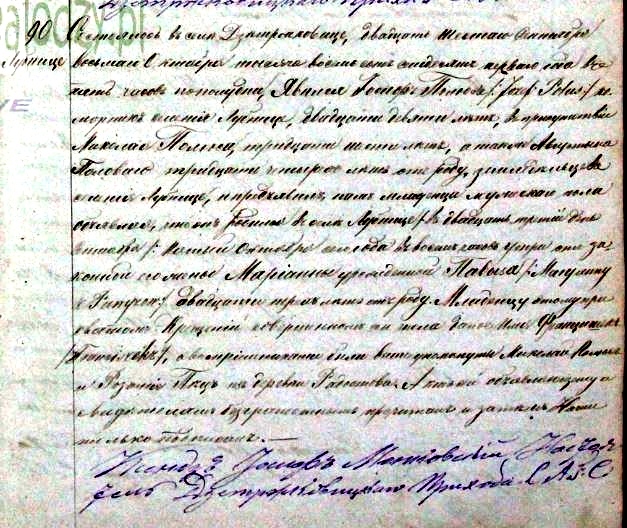 Leon Murawski, a single man, 23 years old, born in Ejszeryszki, son of unmarried Jozafata Murawska, now living in Maszutkinie in the garden? Antonina Meszkajtys, a miss, 18 years old, born in Bokszyszki, daughter of Jerzy and Paulina nee Rozmier (or maybe Rozmerska??? 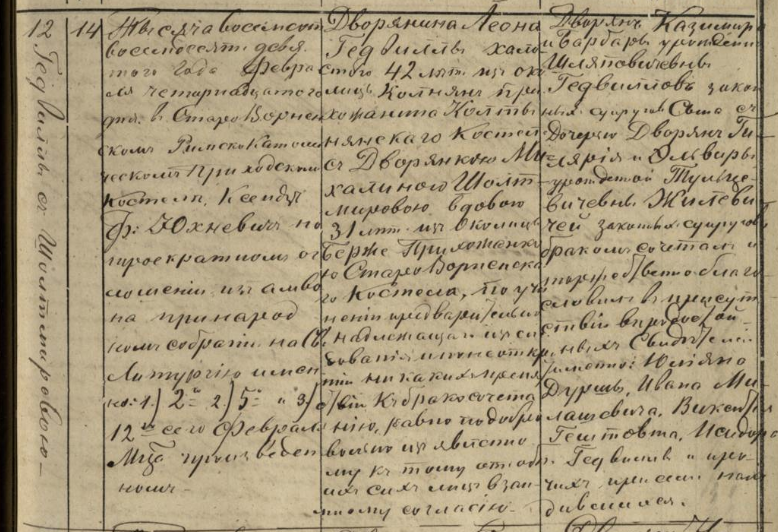 ), spouses Meszkajtys and living in the garden with her parents in Bokszyszki. 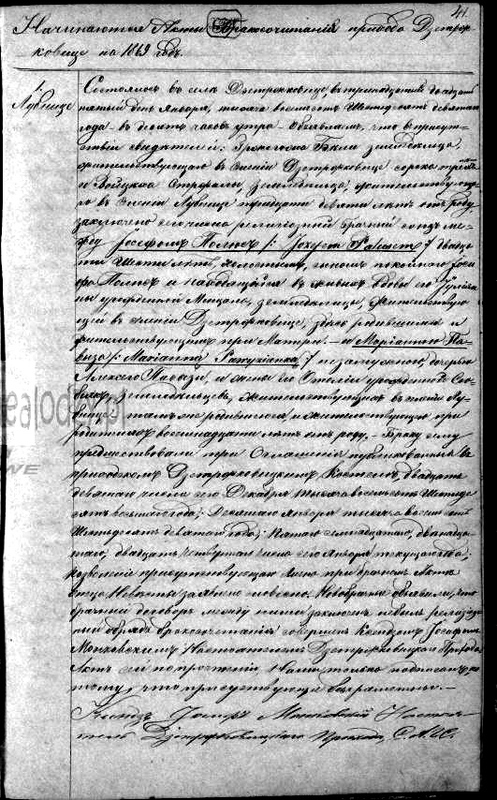 this marriage was preceded by 3 banns announced in Wiżajny parish church on: 17 September, 24 September and 1 October of the current year. Bride's parents gave oral permission for this marriage. Religious marriage ceremony celebrated by the priest Jan Więcewicz, Wiżajny parish parson. Jan Więcewicz signature, parish parson, serving as civil registrar. 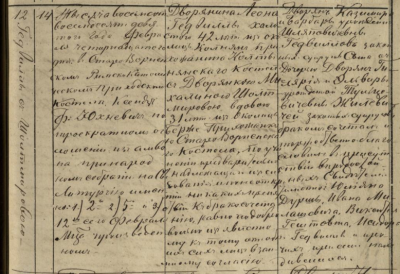 Here is the other record which is the birth record Antonina Meszkajtys, birth record. Bokszyszki. To have the entire records translated provides interesting clues in further research. Thank you very much. it happened in Wiżajny on the 8th/20th day of October 1875 at 2 p.m.. Appeared in person Jerzy Meszkajtys, gardener, living in Bokszyszki, 40 years old in the presence of Jan Mazurkiewicz, 40 years old and Józef Wiszniewski, 36 years old, both farmers living in Bokszyszki and presented Us a female child informing that the child was born in the village Bokszyszki on the 6th/18th of the current month and year at 6 a.m. with his legal wife Paulina nee Rozmierska, 38 years old. At the Holy Baptism held today by the priest Jan Więcewicz the child was given the name Antonina and the godparents were: Jerzy Meszkajtys and Wiktoria Wiszniewska. this act was read aloud to the iiliterate declarant and witnesses and signed only by Us. priest Jan Więcewicz, parish parson, serving as civil registrar. 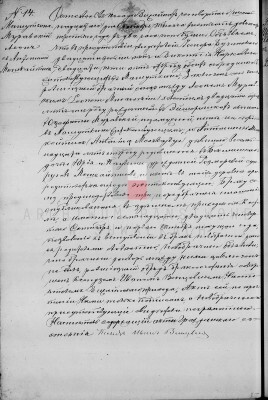 Can you assist me with translating a varniai parish marriage record? 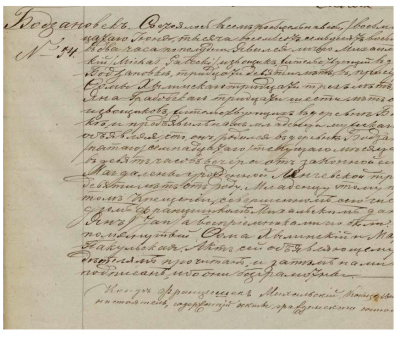 By the way, just let me know if the marriage record that I posted is too challenging to translate ... I'll absolutely understand. after 3 marriage banns annouced in the front of people gathered during the Holy Mass, on the: 2nd, 5th and 12th day of February. newlyweds: Nobleman Leon Giedwiłło, a single man, 42 years old, from the Kołtyniany area, Kołtyniany church parishioner with nobleman Michalina Szołtszor, widow, 31 years old, living in Berże area, Stare Wornie church parioshioner. daughter of: noblemans Hilary and Elwira nee Tulcewicz, legal spouses Żylewicz. witnesses: Julian Dursz, Iwan Miłaszewicz, Wincenty Hesztowicz, Izydor Giedwiłło and others. 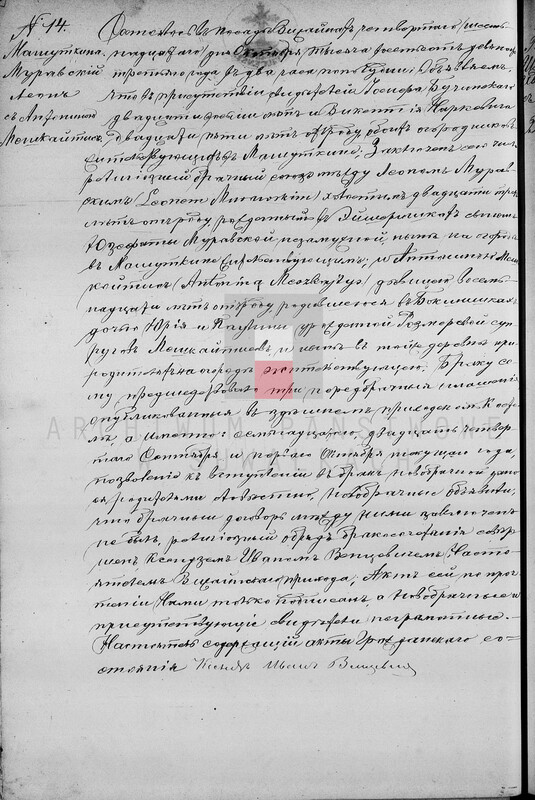 I was wondering if I can have my great grandfather's birth record, #54, translated as well. His name is Jan Galecki. His father's name is Michal Galecki. I am so excited to know where my family comes from in Poland. It happened in the village Kościelna Wieś on the 8th/20th day of June 1878 at 2 p.m. Appeared in person Michał Gałecki, cabman living in the village Bodzanówek, 39 years old, in the presence of Tomasz Chyliński, 33 years old and Jan Grabowski, 36 years old, cabmans living in the village Bodzanówek and presented us a male child informing that the child was born in the village Bodzanówek on the 5th/17th day of the current month and year at 9 p.m. with his legal wife Magdalena nee Lenczewska, 39 years old. At The Holy Mass held today by the priest Franciszek Michalski the child was given the name Jan and the godparents were: mentioned above Tomasz Chyliński and Marianna Pakulska. This act was read aloud to the declarant and present and signed only by us because they are illiterate. priest Franciszek Michalski, Kościelna Wieś parish parson, serving as civil registrar. 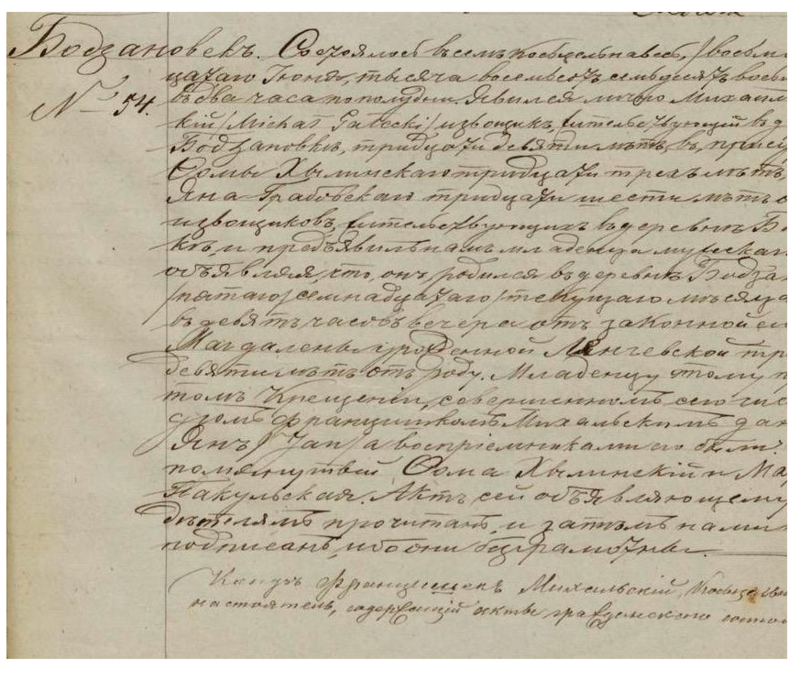 I would appreciate a translation of these documents for Jozef, Franciszek and Jan Polus. Thank you in advance.